NCHM JEE Application Form 2019 - National Testing Agency (NTA) closed the registration process for NCHM JEE 2019 on March 25, 2019. Candidates could pay the fees till March 26 (till 11:50 p.m) The authorities released the NCHM JEE 2019 application form in online mode on January 15. All those who will be appearing for the entrance test could submit the NCHM JEE application form 2019 till March 25. Earlier the last date to fill the application form was March 15 which was extended to March 25, 2019. Since the application date was changed, the last date for paying the fees through debit and credit card was also changed from March 16 to March 26, 2019 (till 11:50 p.m). Earlier National Council of Hotel Management and Catering Technology (NCHMCT) used to release NCHM JEE application form and exam was also conducted by NCHMCT. Candidates must ensure that they meet all the eligibility criteria before they start filling NCHMCT JEE 2019 application form. NCHM JEE entrance exam will be conducted by NTA on April 27, 2019. The exam will be conducted in computer based mode. Go through all the information related to NCHM JEE application form 2019 such as the important dates, documents which need to be uploaded, the registration fee, mode of payment of the NCHMCT application fee, steps that need to be followed and much more. Watch Careers360's Exclusive Video on "How to Fill NCHM JEE 2019 Application From"
The National Testing Agency notified the candidates through an SMS that if there is any discrepancy in the image that they have uploaded they could rectify it by uploading the image which is as per the specifications and dimensions that are mentioned. The message was sent to the candidates at their registered mobile number. Candidates had to re-login using their registered id and password and make the necessary changes in the NCHM JEE application form 2019. 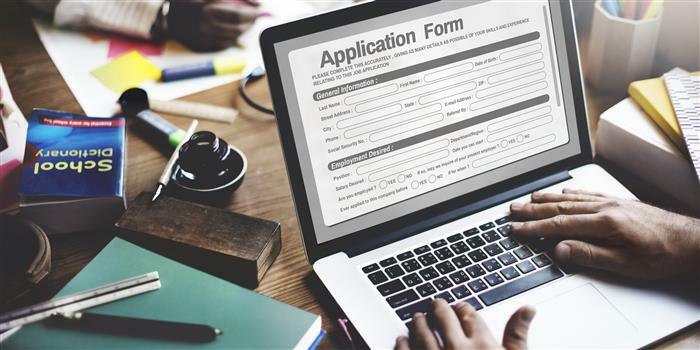 Candidates have to keep the following document and information ready before they start filling the NCHM JEE application form 2019. Candidates can follow the steps that are given below while filling NCHM JEE application form 2019. All the information furnished in the application form of NCHM JEE has to be correct. If it is found that the candidate has provided any incorrect information, then in that case, the candidate is likely to face stringent action such as being debarred from admission at a later stage. Unregistered candidates have to click on the link given above and then press on 'Apply' button. After pressing on the button, they are redirected to a page wherein they can download the information brochure and read the instructions and procedure for carefully for online submission of NCHM JEE application form 2019. After reading the instructions, aspirants have to tick against 'I have downloaded Information Bulletin and went through the entire instructions.' Post this, they have to press on 'Click here to Proceed' button. It should have at least one Upper case, one Lower case alphabet and one numeric value. In this part of NCHM JEE application form 2019, students have to enter security pin and then click on 'Submit' button. After clicking on 'Submit' button, applicants get a pop up message wherein they are asked to review the information carefully. If you want to change any information, press 'Edit Registration Form' button or press 'Final Submit' button for final submission. In this section of NCHM JEE application form, applicants have to tick against the following details, which ensure that they have verified them carefully. Note-Applicants should verify all the information related to their names, father's name, mother's name, date of birth, gender, address, mobile number and email ID. Once the registration form is submitted, applicants doesn't get any option for correction. After verifying the above-mentioned information, students have to click against 'I Agree'button' and then click on 'Final Submit' button. After clicking on 'Submit' button, a message will pop up wherein candidates will be asked 'If they wish to submit the registration form finally?' They have to click on 'Yes' button if they wish to submit it. Candidates have to login again by using their application number and password and then proceed to fill the NCHM JEE 2019 application form. Place of class 12th / Qualifying Examination Schooling? Whether English is one of the compulsory Subject in Class 12th? Choice of examination centre. Candidates can select at least four cities from the list of NCHM JEE exam centres 2019 where they can appear for the entrance exam. Aspirant have to enter the security pin and click on 'Submit' button. After pressing on 'Submit' button, candidates will receive a pop up message where they will be asked to review and tick against the following information. If they want to change any information, they may do by pressing ' Edit Application Form Data,' or click on 'Final Submit' button for final submission. After verifying all the above-mentioned information, applicants have to tick against 'I Agree' and then click on 'Final Submit' button. Students again get a message 'Do you wish to Submit Application form finally? Press 'Yes' to submit the application form. Candidates have to upload the scanned images of their photograph and signature in accordance with the specifications given above in the table. Post uploading the documents, students have to enter the security pin and then click against 'I have verified uploaded images carefully.' Next click on 'Upload' button. After uploading the documents and filling the NCHM JEE application form 2019, candidates have to pay the registration fee. Candidates have to print the NCHM JEE application form 2019 and keep it safely for their future reference. NCHM JEE application form 2019 has to be filled completely. Incomplete application form leads to rejection. Any request for modification in NCHM JEE 2019 application is subjected to get rejected.